The answer is an unquestionable YES, though I think we really have the pre-merger Stanley to thank. One of my co-workers has a knife that is very similar to what DeWalt is currently offering, which appears to be a first generation Stanley version of this knife. 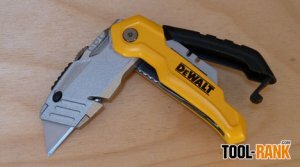 After a little bit of searching, it turns out that Stanley did if fact make a FatMax knife that is very similar, if not identical, to the DeWalt knife in this review. But who made what is not really important now that they are one happy family. So what makes this folder so much better in my eyes? Well, unlike other folding utility knives, the DWHT10035 gives the user the option to retract the blade into the body of the knife. This feature makes the knife a bit bigger, but it also allows the user to keep the knife unfolded during periods of use without having to worry about the exposed blade. The knife is also the most comfortable folding utility knife I have used and I think that is mostly because when the knife is unfolded, it is more similar to a regular utility knife in shape and size. A thumb pad directly behind the blade is a great addition, and should be standard on all of there knives from now on; it adds a nice bit of extra grip. DeWalt has taken other features from their utility knives and included them inside the DW Retractable Folder to make it just as good as their top of the line non-folding utility knife. These features include the Quick-Change tool-less blade changing feature, integrated string cutting slot, and on-board blade storage that is accessed via a swing out door. In a sense, I like the DWHT10035 because it is basically an old Stanley Quick-Change knife, that has a bonus folding feature. Priced at around $10, the new DWHT10035 Folding Retractable Utility Knife costs the same as the non-folding verity; so if you want folder that acts like a non-folder, you should give the DWHT10035 a try.